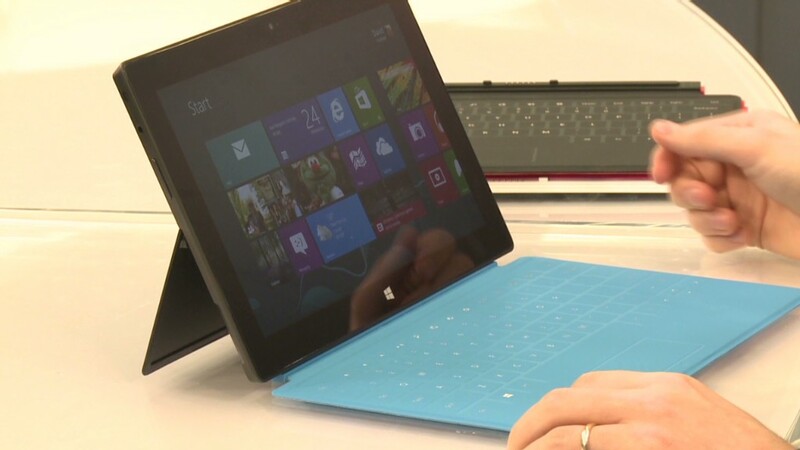 Microsoft on Thursday announced that the full Windows 8 version of its Surface tablet will go on sale in January for $899. That's slightly cheaper than expected. The conventional wisdom was that the Surface Pro would sell for $1,000 -- a price bar Microsoft ducked under by packaging the device's keyboard cover separately. Adding the keyboard to the entry-level 64 gigabyte Surface Pro takes the total cost to at least a grand. A 128 GB version of the tablet will cost $999, also without the keyboard. Microsft's add-on keyboard typically costs $120, or $100 when it's purchased as part of a Surface bundle. The Surface Pro has a number of similarities to the basic, $499 Surface tablet that went on sale a month ago: They have the same 10.6-inch screen size, magnesium casing, and many common tech specs. But unlike the basic Surface, the Surface Pro doubles as a PC. It runs Microsoft's full Windows 8 operating system and all of Windows' legacy software. Surface Pro comes with a faster Intel (INTC) Core i5 microprocessor, which will enhance graphics that can be a bit sluggish on the basic Surface. The Pro version of the Surface also supports a digital pen interface for notetakers, with an innovative "Palm Block" technology that Microsoft (MSFT) says will allow users to rest their palms on the touchscreen while writing on it. That makes the Surface Pro about a half a pound heavier and 5 millimeters thicker than its basic cousin. Microsoft has put significant marketing muscle behind Surface, which it hopes will pressure PC makers to become more innovative with their tablet designs. Microsoft also hopes, of course, that Surface becomes a commercial success in its own right. The company said earlier this week that it is happy with the consumer adoption of the tablet, despite its limited distribution. The only way to buy a Surface is directly from Microsoft, either through its online store or its handful of physical shops. Microsoft also announced this week that it has sold 40 million licenses of Windows 8 after one month on the market, matching the early pace of Windows 7.